OVERVIEW: On October 6, 2009, Sony Pictures Home Entertainment invites you to witness the evolution of comedy as the hilarious YEAR ONE arrives on Unrated Blu-ray and DVD, plus Theatrical Edition DVD and PSP®. Created by comedy legend Harold Ramis (Caddyshack, Groundhog Day), YEAR ONE stars Jack Black (Nacho Libre, Tropic Thunder) and Michael Cera (Juno, Superbad) as an unlikely duo of primitive men who, after being exiled from their tribe, set out on a laugh-out-loud journey through the ancient world. Along the way, they encounter a host of famous historical figures played by a tribe of film comedy’s best, including Hank Azaria (Night at the Museum 2), David Cross (TV’s “Arrested Development”), Christopher Mintz-Plasse (Superbad), Oliver Platt (2012, Frost/Nixon), Paul Rudd (I Love You, Man) and Horatio Sanz (TV’s “Saturday Night Live”). Trust us, history has never been this crude, rude or historically funny! SYNOPSIS: History was made...by these guys? 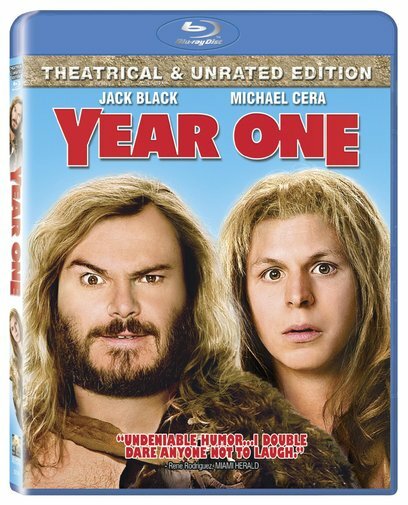 Zed (Jack Black) and Oh (Michael Cera) are cavemen who stumble out of the mountains into an epic journey of biblical proportions. One’s a bumbling hunter, the other’s a gentle gatherer; together, they become unlikely participants in history’s most pivotal moments. Directed and co-written by comedy legend Harold Ramis (Groundhog Day, Caddyshack, Analyze This), YEAR ONE is rude, crude, wildly absurd, deliciously tasteless and laugh-out-loud funny! In terms of Special Features, the Blu-ray is loaded. It includes both the original theatrical version of the film and an all-new Extended Version with even more irreverently funny footage not shown in theaters, plus cool bonus features like deleted scenes, extended and alternate scenes, an alternate ending, Line-o-Rama, gag reel, audio commentary with director Harold Ramis, Jack Black and Micheal Cera, the making-of featurettes “Year One: The Journey Begins,” “Sodom’s Got’em” and “Leeroy Jenkins: The Gates of Sodom”. This release also includes exclusive to the Unrated Blu-ray Disc™ of YEAR ONE are the highly evolved special features “Year One Cutting Room,” which lets viewers create their own video using clips and music from the film, and share it on BD-Live™. YEAR ONE also includes the newest BD-Live feature from Sony Pictures: movieIQ, which lets viewers access real-time trivia information about YEAR ONE’s cast, crew, music and production, all while watching the movie (powered by Gracenote). The Blu-ray version also features cinechat, which allows movie watchers to send on-screen instant messages to friends around the world while watching the movie and, finally, a Digital Copy for playback on PC, PSP®, Mac or iPod. Overall the film wasn't as bad as I was expected. From the trailers the film doesn't look attractive and may be that's why it fail to perform well at the box office this past Summer. I got a good few laughs out of it and at least I didn't felt like I wasted 90 minutes of my life in it. It seems like Jack Black just continues to deliver the same character over and over again. Subtitles: English, Spanish French and Portuguese.